As back-to-school season has entered its peak month, retailers are on the edge with initiatives to perk up sales. This is the second-busiest shopping season (mid July to mid September) after the Christmas holidays, with sales generally picking up in mid August. This year, back-to-college spending is expected to be at its highest level ever while back-to-school spending is expected to see one of the three highest years on record. As per the National Retail Federation (NRF), combined spending on back to school and college is expected to reach $82.8 billion, slightly down from $83.6 billion last year. A thriving economy buoyed by tax reform and growing consumer confidence has been the biggest catalyst. Families with children in elementary through high school is expected to spend $684.79 per child on clothing, electronics such as computers, calculators or phones, shoes, and other school supplies such as notebooks, pencils, backpacks and lunchboxes, for a total of $27.5 billion. This is the third-highest spending following a peak of $30.3 billion in 2012 and last year’s $29.5 billion. Per eMarketer, overall back-to-school season sales are expected to reach $885.2 billion, rising 3.5% this year versus 3.7% last year. Of this, ecommerce will likely account for nearly 10% of sales this year, reflecting an increase of 15.4%, up from the last year’s gain of 15%. Departmental stores and online retailers are the most-attractive shopping destinations. About 57% of the back-to-school shoppers and 40% of the back-to-college customers will drive to departmental stores while 55% and 49%, respectively, will shop online. In the final weeks of the ongoing shopping season, retailers continued to lure customers with more promotional offers such as cash back, coupon discounts and free shipping. The online e-commerce behemoth Amazon (NASDAQ:AMZN) is offering up to 60% off on school supplies and Lexmark printer, and up to 40% on select backpacks. It is also enticing customers by proposing to save $100 or more on Acer laptops. Meanwhile, the world’s largest retailer, Walmart (NYSE:WMT), has a great deal on kids’ clothes, shoes, and school uniforms. It has a super-big selection of backpacks on sale, including character-licensed bags from Marvel, Disney and so on, and is offering Spider-Man or Frozen backpack-lunchbox combos for just $11.99 or $12.99, respectively, each down from $18.88. Tech giant Apple (NASDAQ:AAPL) is offering a free pair of Beats headphones with the purchase of a Mac computer or iPad Pro. Best Buy (NYSE:BBY) is also not behind, offering a series of student-exclusive deals including $50 off on select Chromebooks and select iPad models, $30 off on Microsoft Office packages, $150 off on select Macbooks, and 10% off on Google Pixelbooks. Target (NYSE:TGT) is promoting deals on clothes, backpacks and school supplies, with a big selection of products from the new brands the big-box retailer rolled out in recent months, like kids’ Cat & Jack T-shirts with fun graphic prints for just $5, a discount of 17%, Cat & Jack backpacks starting at just $15. It is also offering up to 25% on dorm furniture and 25% off on the purchase of another pilot pen. Macy’s (NYSE:M) is proposing back-to-school clothing as low as $15 and up to 20% off on backpacks using the code “BTS.” Schools supplies at Staples are as low at 50 cents. Its special attraction includes getting 25% off on school supplies when bought with a backpack, plus up to 80% off on other school supplies. JC Penney (NYSE:JCP) has a series of deals on kids’ clothes, including $10 off on select school uniform purchases of $50 or more. The retailer is also running an online-only sale of 25% off on purchases of $100 or more with the promo code 7BIGSALE. Kohl’s (NYSE:KSS) is offering free shipping on orders of $75 or more and has some great deals like 25% off on gym gear from Under Armour, or the slip-on boys’ Vans skater sneakers in the brand’s iconic checkered pattern in black or red and white, for just $33.99 (down from $44.99). The SPDR S&P Retail ETF (NYSEARCA:XRT) tracks the S&P Retail Select Industry Index, holding 89 securities in its basket with each accounting for less than 2% of assets. Apparel retail takes the top spot at 23.5% share while automotive retail, Internet & direct marketing retail and specialty stores round off the next three spots with a double-digit allocation each. The fund has amassed $624.3 million in its asset base and charges 35 bps in annual fees. The fund has a Zacks ETF Rank #1 (Strong Buy) with a Medium risk outlook. The Amplify Online Retail ETF (NASDAQ:IBUY) offers global exposure to companies that derive 70% or more revenues from online and virtual retail by tracking the EQM Online Retail Index. The fund comprises 39 stocks that are widely diversified, with each holding not more than 6.6% of the assets. It has attracted $521 million in its asset base and charges 65 bps in fees per year. The ProShares Online Retail ETF (NYSEARCA:ONLN) is the newly debuted ETF in the space focusing on global retailers that derive significant revenues from online sales. It tracks the ProShares Online Retail Index, holding 21 stocks in its basket with about one-fourth exposure going to Amazon. American firms make up three-fourth of the portfolio, while China accounts for 21.5% share. Argentinean companies take the minor share at 3.01%. ONLN has accumulated $7.6 million in a month and charges 58 bps in annual fees. The VanEck Vectors Retail ETF (NYSEARCA:RTH) provides exposure to the 25 largest retail firms by tracking the MVIS US Listed Retail 25 Index. It is highly concentrated on Amazon at 20.4% while the other firms hold no more than 11.5% share. The ETF has a certain tilt toward specialty retail, which accounts for 31% share while food & staples retailing (25.4%), Internet & direct marketing (23%), and multiline retail (10.9) round off the next three spots. The product has amassed $93.9 million in its asset base and charges 35 bps in annual fees. RTH has a Zacks ETF Rank #3 (Hold) with a Medium risk outlook. The Invesco Dynamic Retail ETF (NYSEARCA:PMR) follows the Dynamic Retail Intellidex Index. In total, the product holds 30 securities, with each holding no more than 5.8% of assets. Specialty retail and food & staples retailing take the largest share at 38.8% and 23.5% followed by 18.3% exposure in multiline retail. The fund has accumulated just $12.4 million in its asset base and charges 63 bps in fees per year. It carries a Zacks ETF Rank #2 (Buy) with a Medium risk outlook. 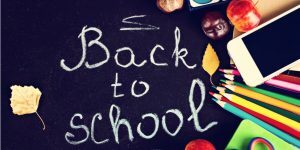 Article printed from InvestorPlace Media, https://investorplace.com/2018/08/bet-5-etf-back-school-shopping-ggsyn/.